Living… in Manhattan Hospital’s psych ward where he is being looked over by a special psychologist named Dr. Eudora Fletcher. Dr. Fletcher has diagnosed Zelig as a “human chameleon” – he can adapt to any social surrounding and fit in with ease. His interests will change depending on what sort of company he keeps. At a fancy Long Island garden party he will take on the character of a Boston aristocrat, but in an oriental opium den in Manhattan’s tenement buildings he will take on the physical characteristics of a Chinese man. Profession… socialite. He attends all sorts of different parties and social events in 1920s America. Relationship Status… complicated. Some women complain that Zelig loved them and left them, but Zelig doesn’t even remember them. The only constant relationship he has is with his doctor Eudora. Challenge… becoming his true self. 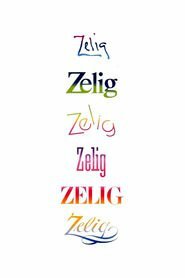 Zelig’s shape shifting properties are the result of a deep insecurity: he just wants to be like everyone else. Personality… fickle, neurotic, and conformist. Zelig has no true personality of his own; he merely shifts from one fake persona to another. Within the space of the day he can inhabit the role of a rich republican, an opium-addicted Chinese man, or even a right-wing fascist. Leonard Zelig's popularity ranking on CharacTour is #4979 out of 5,000+ characters. See our top-ranked characters and read their profiles.